You don't have to wait until your child has a mouthful of teeth to start teaching them how to take care of them. Even though those pearly baby teeth will eventually fall out, they're critical to your child's development and help with everything from supporting craniofacial growth to aiding in speech development. Plus, the sooner you start a consistent teeth brushing routine, the more likely it is that your little one will maintain proper dental care for the rest of her life. Once those little tooth buds break through, you're good to start brushing. Then from age three and up, you can switch to an electric toothbrush for an even better clean. 2. So it's important...but that doesn't mean it can't be fun. Like everything else in their little lives, children are more likely to do something if it's fun for them. And that certainly includes caring for their chompers. Help them look forward to brushing by providing a fluoride toothpaste in a flavor they'll enjoy (my daughter loves her quip watermelon toothpaste). Let them wear a special cape while they "fight cavities!" Or give them a cool upgrade on a traditional toothbrush, like quip's Kids electric toothbrush. My daughter calls hers her "magic toothbrush," and the first time she opened it, she asked to brush her teeth three times that day.Now that's a #mamawin. 3. Brush up on the basics. "Toddlers rarely have the dexterity or motivation to brush their own teeth properly, so parents should feel comfortable taking brushing into their own hands―literally," says Elisa Brittain, RDH, BS. "It's common for parents to let their children brush their own teeth without any kind of supervision, but this can lead to children not brushing for long enough or the right way." The American Dental Association recommends starting children under the age of three with just a smear of toothpaste (and upgrading to a pea-sized amount after their third birthday), then using gentle, circular strokes on each quadrant of the mouth. Ultimately, you should aim for two full minutes of brushing (and that goes for adult mouths as well!). 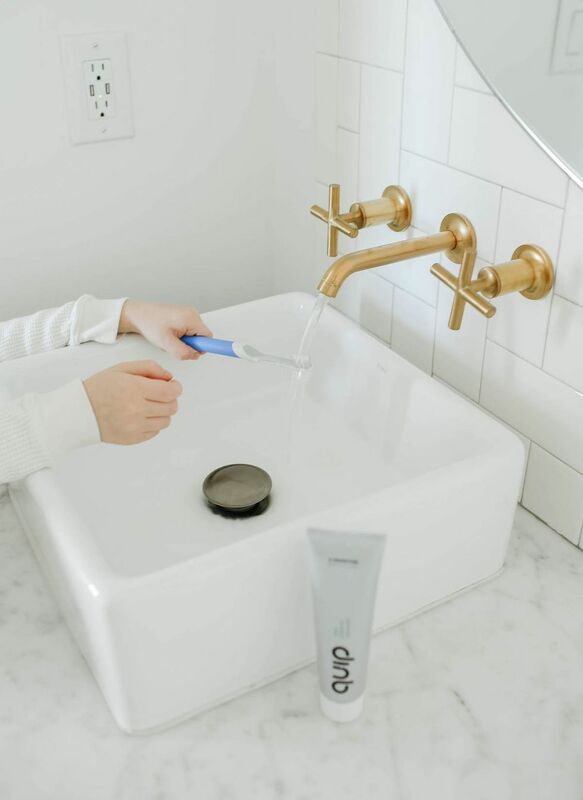 quip's toothbrush makes it easy to know when the time is up thanks to a built-in timer, and the sonic vibrations will help ensure teeth are getting clean while your little one gets the hang of it. 4. Add in more steps as your child is ready for it. You already know you should be flossing at least once a day and using a mouth rinse for a more complete clean (right, mama? ), but these steps can wait for littler mouths. "Younger kids under the age of six shouldn't use mouth rinses, as their swallowing reflexes aren't fully developed and they can end up swallowing it," Brittain says. "Once children turn six and are able to properly spit out on their own, mouthwash can be used under parental supervision." Flossing is more important once their teeth start to touch, but you can introduce it earlier to start a good habit. 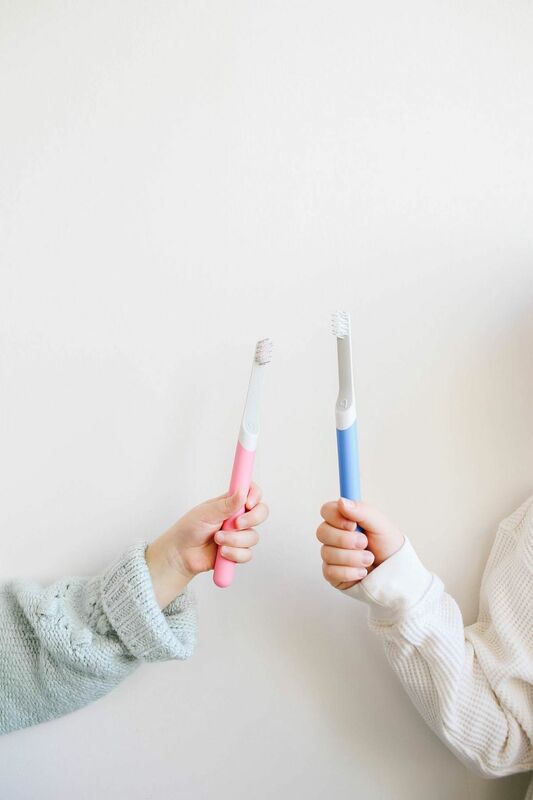 Studies have shown that children who brush with their parents can have better oral health than children who brush solo―and having a toothbrush that looks almost identical helps your child to feel grown-up and responsible, ultimately leading them to want to brush more. Try turning teeth brushing time into a family dance party and playing a special song while you brush to help your child (and you!) hit that two-minute mark. When my daughter sees me take my own toothbrush out, she usually runs to grab her own without my having to nag her once. 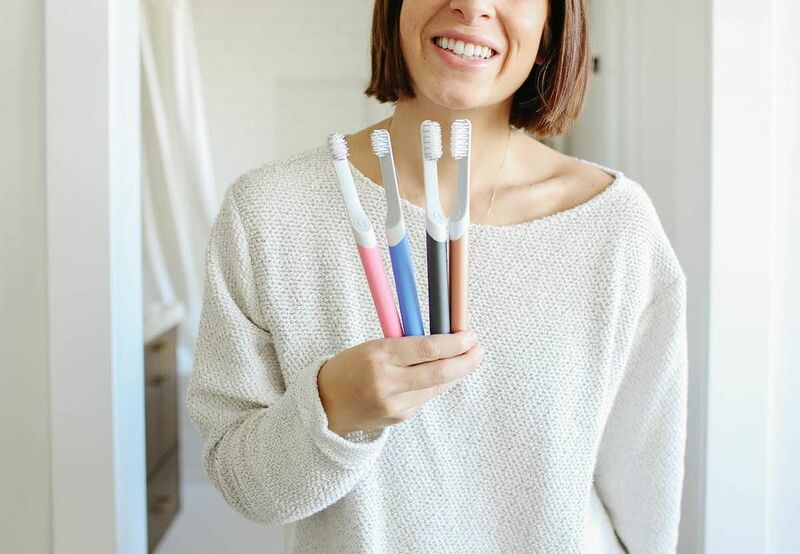 I also love that quip sends me toothpaste and replacement heads for our brushes every three months―meaning it's easy to set a good example and there's one less thing for my overloaded mom brain to remember. Try quip, starting at $25, with brush head refills for just $5, every 3 months! Plus, Motherly readers will receive an exclusive $10 refill credit through this link. It's time for the whole family to brush better, mama. This article was sponsored by quip. Thank you for supporting the brands that support Motherly and mamas.